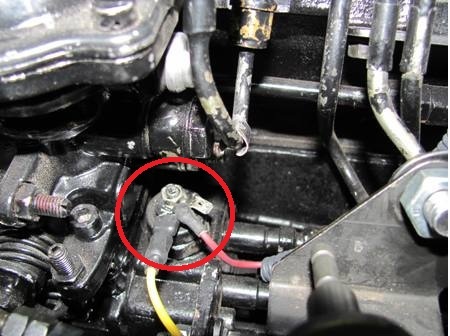 If you are starting your Cummins for the first time, it is required to “bleed” the air out of the injector lines by loosening the injector line nut just enough to allow fuel and air to escape the line while you are cranking the engine. It is usually required to do at least 3 injector lines. Tightening the line nut while you are still cranking the engine is the best way. This is also a good way to verify that the injector pump’s shut down solenoid is allowing fuel to the injector. If your supply fuel line is loose, it is possible to draw air into the fuel system at that point, so if you suspect you are not getting rid of the air in the system check your supply line connections. These engines should have between 7-15 psi of lift pump fuel pressure. We have banjo bolts available that allow you to connect a gauge to your fuel system. If you have no fuel at the injector, but you have good fuel pressure, then your shut down solenoid is not working properly. The shut down solenoid is shown inside the red circle in the picture below. These can be removed from the injector pump and inspected. There is a small plunger that can break or get stuck. If you have poor supply pressure, you may have a bad lift pump, or possibly restricted or leaky supply lines. If you have never ran the engine before, or the injector pump has been worked on- check the return line banjo bolt (shown in the pictures below). 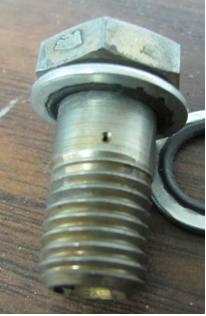 This is a special banjo bolt with an orifice hole that regulates the fuel pressure inside the injector pump. If you have a full flow banjo bolt in this port your lift pump pressure will be too low. The location for the banjo bolt is shown in the picture below with the red outline arrow pointing to the banjo bolt head.